Is perio really a risk factor for heart disease? I am convinced beyond a shadow of doubt that treating gum disease goes way beyond saving teeth. Treating periodontal disease is a LIFE SAVING gift we can offer our patients. Are you doing all you can to help you patients say yes to treating gum disease? Are telling your patients about the relationship that perio has with heart disease, stroke and diabetes? Watch this 3 minute video to learn more. What will your patients think? If you’re like just about EVERY dental professional I’ve ever met, you’ve asked yourself this question when you’ve been faced with telling a long standing patient they have active periodontal disease. It’s so common…especially when you’re working on taking your diagnostic skills to the next level and being more proactive with your treatment recommendations. What will my patients think? One thing we are hyper-aware of when we coach our client teams is that while you are obligated to tell your patients when they have active disease, it must be done in a way that preserves the relationship you’ve worked so hard to build with your patients. This week, I’d like to share with you the results of a fantastic team that had this very concern. And I also want to share with you HOW they did it. Scroll down, and I’m going to give you some specific words you can use when you’re in this tricky situation. What will my patients think? This is a question the team at Drs. Belton & Schrimper asked right off the bat. And rightfully so! One of their hygienists has been in the practice for nearly 40 years! 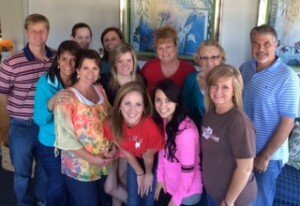 They have worked really hard to build a stellar reputation and close relationships with so many of their patients. I am thrilled to say their results are proof of how well they implemented what they learned through coaching and hands-on training. In just 6 months, they made some impressive progress! So how DO you talk to long standing patients about needing perio treatment? 1-Be sure to read the previous chart notes. Chances are, you (or another hygienist) have talked with them about their bleeding gums in the past. You’ve made recommendations and either they haven’t complied or they haven’t gotten the results you’ve hoped for. 2-Show them the evidence. Show them past perio charts and bleeding in the mirror. Then briefly explain how their oral health hasn’t improved. 3-Tell them you’ve tried conservative efforts. Whether it’s been a more frequent recall interval or a recommendation for better homecare, you’ve likely tried a very conservative approach. 4-‘Your body has not responding as we’d hoped’. If they were at their medical doctor and the diet she recommended didn’t bring their blood pressure down, there would be a new recommendation. 5-It’s time to do something different. You know the definition of insanity, right? Doing the same thing and expecting a different result. If your goal is health then tell your patient ‘It’s time to do something different’. And this is when you present your plan of treatment. Did every single patient say YES to the care this team recommended? No…and that’s ok. Sometimes it’s a matter of ‘planting the seed’. And sometimes, the seed has been planted and the time to present treatment is NOW. This unique Mastermind webinar will feature four dynamic dental practice administrators who will share their combined experience and best practices. You’ll be surprised by their varied backgrounds and impressed by their dedication to excellence. Join me, and my special guests, Carol Baron, Julia Stone, Karlie Miller and Pam Henson for a lively discussion on ‘Best Practices for Dental Administrators’! Successful dental practices have many things in common, one of the most important being a highly functioning and effective administrator or office manager. Ensuring that solid systems are in place and business practices run smoothly are only the beginning. Keeping the team motivated and functioning as a unit is also vital. During this webinar, four dedicated and very determined practice administrators will share their ‘best practices’ in these areas and more. I’ve been in dentistry for over 18 years. I began as a receptionist. I was inspired to take on a clinical role and earned my RDA. A few years later, I became a treatment coordinator, followed by a financial coordinator. These experiences, along with continuing education, led me to my current role proudly serving as an office manager for the last 5 years. The desire to serve and improve my skills led to achieving my Fellowship with AADOM in 2014. For over 21 years I have served as a manager in endo, perio and general practices. Originally I worked with a CPA and one our clients was a dentist. His manager retired, he offered me a position and the rest is history. I’ve been an AADOM member for 5 years and a manager at Hillsdale Dental in San Jose, California for the last 12 years. I love being part of helping patients achieve their dental health goals. I have been in dentistry for 32 years, as a Registered Dental Assistant and then an Office Manager. I am an active member of AADOM and received my fellowship in 2014. I have worked with the wonderful Dr. Thomas Frank and team for more than 12 years, during which time I have also had the pleasure of working with Janice Hurley, a practice management specialist. I’ve been a dental practice administrator for over 11 years, the last 5 for Salina Dental Arts. My background, prior to dentistry, was in Hotel Management. For the last year I’ve also worked with Dr. Sharon Tiger, a practice management expert who has helped us refine our systems and procedures. I love seeing patients transform their lives through dentistry and the gift of a new smile. This call will be available in our Mastermind Library on June 18. If you’re not already a member of our Mastermind group, click here to sign up. The great historian Arnold Toynbee once said “nothing fails like success”. Although that may sound a bit negative, what I believe he means is that when a challenge in life is met by a response that is equal to it, you have success. But when the challenge is moved to a higher level, the stakes have been raised, or the conversation turns from routine to crucial, we will often use our emotional response verses our logical one. Typically this will have a negative outcome leaving us to suffer the consequences. 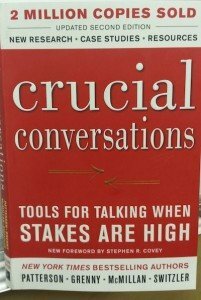 Watch my video below to see how the book I have recently read, Crucial Conversations by Patterson, Grenny, McMillan and Switzler has helped me and millions of other readers, have more win-win outcomes with our crucial and important conversations.